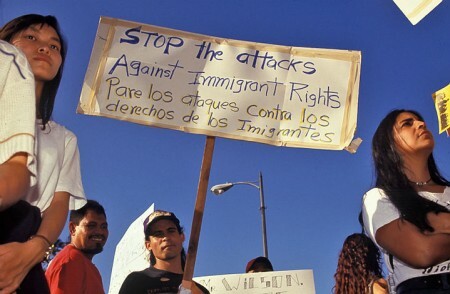 The Illegal Immigration Reform and Immigrant Responsibility Act of 1996 was signed into law by President Bill Clinton and vastly changed the immigration laws of the United States. Immigrants Rights groups protest outside the Federal building in downtown Los Angeles. © Donna De Cesare. Title III of this new act created the notion of “unlawfully present” persons with penalties or bars of 3 years, 10 years and a permanent bar to legal entry into the US. Specifically any person who has remained illegally in the US (including overstaying a legal visa) for 180 days but less than 365 days is barred after deportation for 3 years before they can seek legal re-entry by applying for a visa. Those who have overstayed their legal visas or resided illegally in the US for longer than 365 days must remain outside the United States for ten years unless they are granted an official pardon. If a person returns to the United States without the pardon they cannot apply for a waiver for a period of ten years. This effectively becomes a permanent bar to legal entry. These restrictions apply regardless of whether the person has a United States citizen spouse and/or children. Prior to passage of this law immediate deportation was triggered only for offences that could lead to five years or more in jail. Under the 1996 Act, minor offences such as shoplifting, make an individual eligible for deportation. The Act also applies to residents who have married American citizens and have American-born children. In addition the 1996 act was applied retroactively to all those convicted of deportable offenses. This included many US legal residents who committed minor offences decades ago. In spite of a 2001 Supreme Court ruling to end retroactive application of the IIRIRA law to legal US residents, there has been little public scrutiny and oversight of its application and the Act has been applied much more vigorously since 9/11.